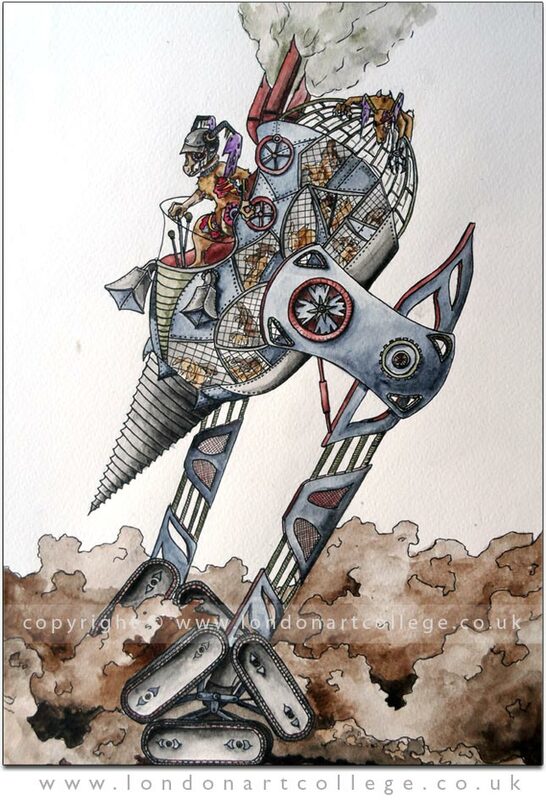 Kate Grinsell has created the most stunning illustration for the Sci Fi Fantasy course. We are thrilled that Kate has been enjoying the course with our lovely Tutor John Byrne and we are looking forward to seeing more form her soon. 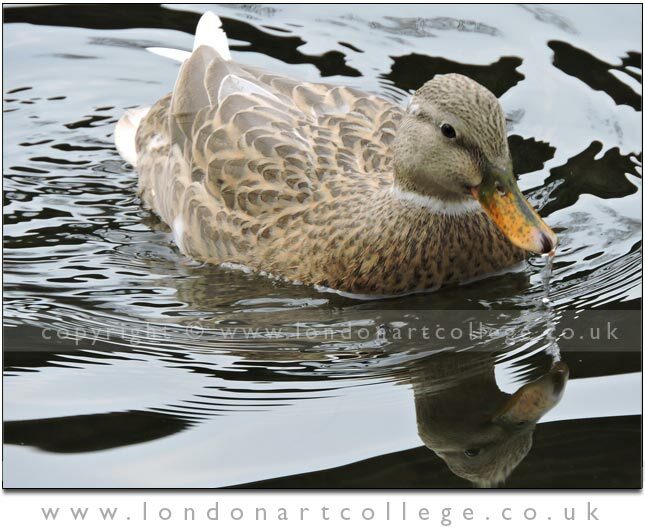 My name is Catriona Jennings and I’m a student on the photography course, my second course with London Art College. I did the children’s illustration a few years ago. I signed up for the photography course just before Christmas. One of the reasons I chose this particular course was that I really enjoyed the forum and found the support from other students really helpful. The forum also provides support in solving technical problems. So now I have a new bridge camera and am learning how to use it. I started the 52-week illustrative challenge on the forum and then thought it would be really nice to have a photography one as well so I found the camera shy 52-week challenge. Each week there is a theme and the group provides a lot of positive feedback and great ideas. I also really enjoy having the challenges on the forum. The latest one is ‘Wood’ and so I’ve been out and about to try find nice pictures. I would love to see some work, not only from other photography students, but also from other courses. I enjoy taking pictures of animals and perhaps they might be useful to the pet portrait students. I have included a picture of a female mallard duck I took a few days ago. 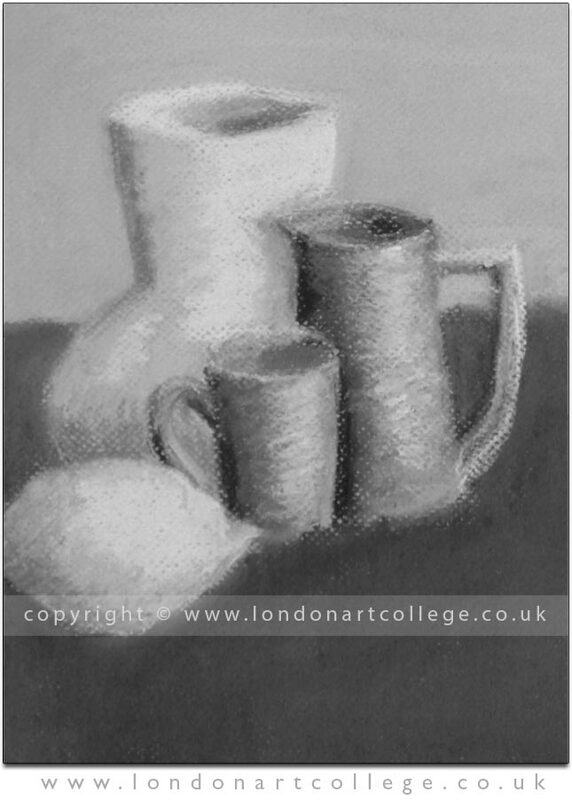 Ann Edward is studying on our Pastels course and this is a superb preliminary study in monochrome using only black, grey and white pastels. Creating preliminary studies like this in greyscale can really help students understand the depth of tones within the scene without having to worry about colour. The final drawing or painting is always a lot easier once this has been completed as students are more familiar with the scene, the shapes, forms and tones. 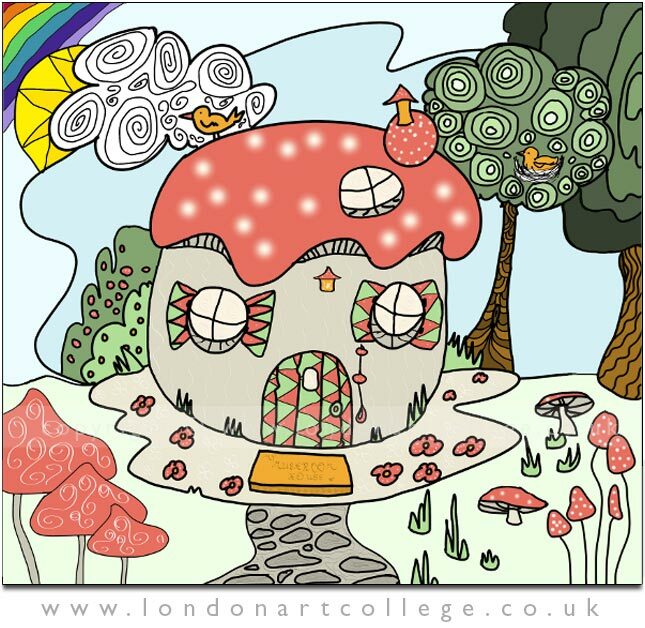 A very colourful collage today from student Karen Logan who is studying with Maggy Roberts on the Illustrating Children’s Books Diploma Course. 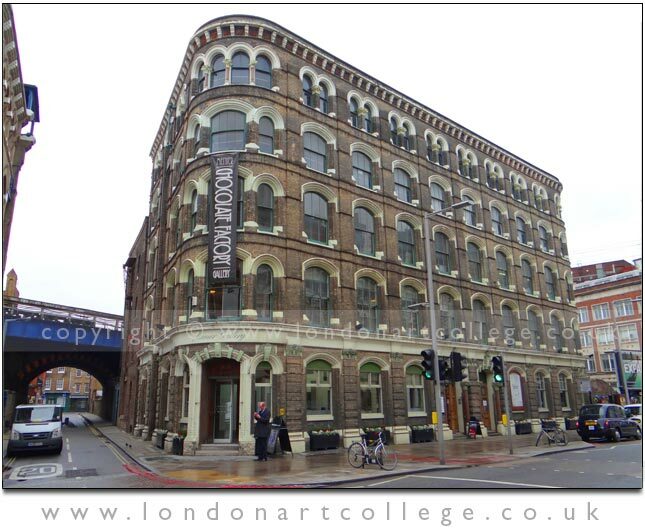 If any of our students would like to see their own artwork posted here on our blog, drop us a line. 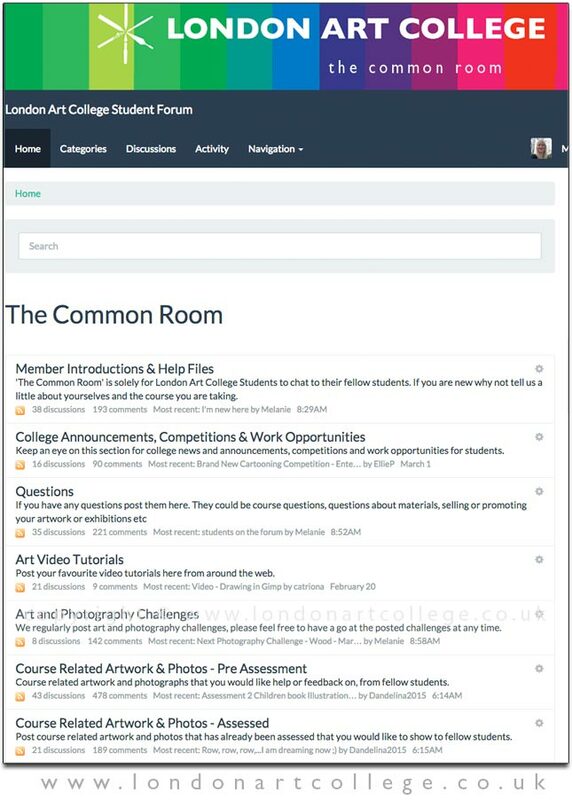 Did you know we have a student forum? All students can join and participate for free! Its called The Common Room and we would love to see you there. You can even login with your Facebook and twitter account of you have one! We are a friendly group and look forward to hearing from you all. I recently helped Geraldine Suggett with a few problems she was having with uploading her artwork to The Art Room. Geraldine emailed me her work and I was so impressed I asked if she would be able to write something about them for our college news blog. Geraldine has written a wonderful piece and woudl like to encourage all of our readers to have a look at Geraldine’s artwork – its wonderful! Enjoy! In 1972 I passed O Level Art. After leaving school, I did nothing more artistically until a few years ago. I have only really been a ‘doodler’ and until only a few months ago, I didn’t know what type of art I wanted to depict. All that changed when I stumbled upon a book by Billy Showell. 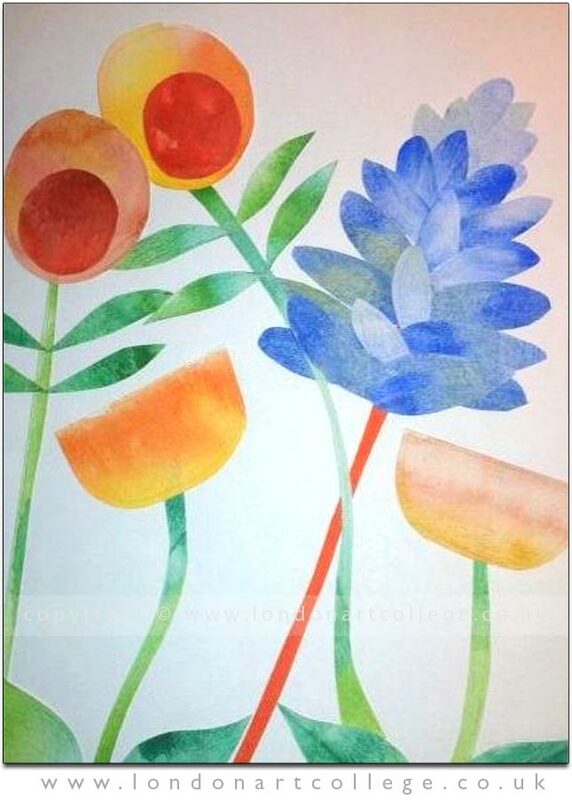 As soon as I saw her work, I knew that it was plants, flowers and vegetables that I want to draw and paint. I have a long way to go, but I feel I have at least got one foot on the rung of the ladder by attempting this diploma course. 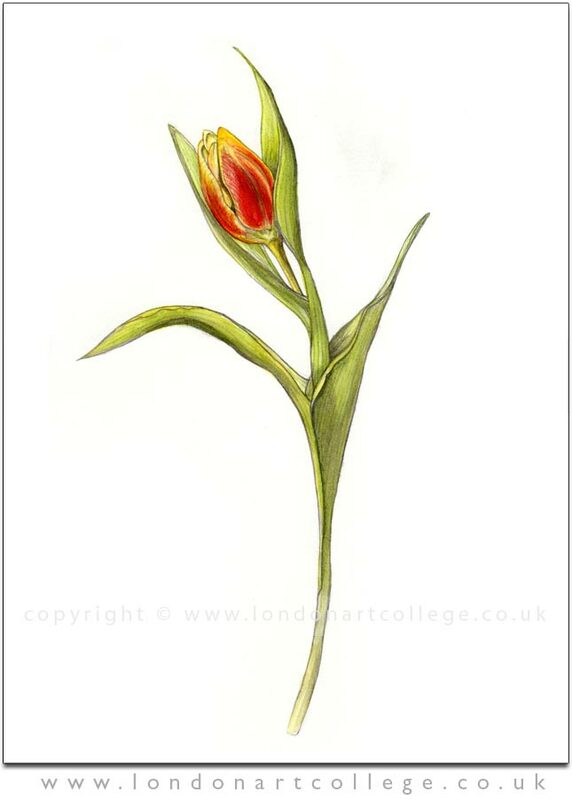 I started the process for this assignment by selecting the tulip that I wanted to depict and drew what I saw and then made adjustments using measurement and dividers. 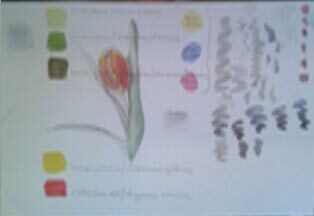 To help me to see the tones, key and colours, I decided to use watercolour pencils for my sketch. I don’t colour in and then apply water with a brush. Rather, I apply the pigment to my brush and then paint just as if I was using my watercolour tubes or pans, using glazes of water and pigment from the pencils. Once I had successfully sketched what I needed I was ready to move on to the proper painting and transferring process. I traced the image from my sketchbook and then transferred the lined image to layout paper. I’m not sure if this was necessary but it certainly helped my hand and eye to get used to the shape of the flower and the leaves. When I was happy with the outlines that I had done, I then went on to transfer the image to two pieces of pre-stretched watercolour paper that I had already prepared. I used The Langton extra smooth hot pressed 300 gms. I slightly altered the position of the left had leaf nearest the flower, in order that it would give the appearance of cradling the flower a little more than the original image. The first monochrome painting didn’t take very long to complete, which surprised me. I then followed the same process for the second painting, taking as much care as I could to reproduce the tones in the second image as they appear in the first image. When dry, I began the colour painting process. I enjoyed doing this very much. Using glazes of just water and then layers of colour I was able to produce the vibrancy of the tulip, to a degree that surprised me. My watercolours usually look much more delicate and so I was pleased to be able to produce a much more brighter image than I am used to. I like to create a swatch on a piece of scrap watercolour paper, rather than in my sketchbook because the paper quality will respond differently to the water and the pigments. 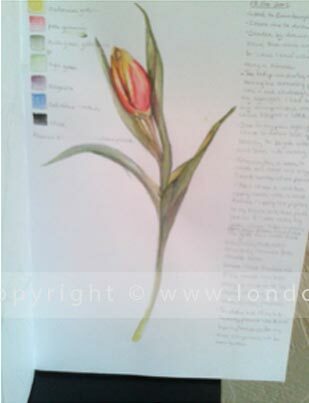 I try not to read the course material too far ahead and so I didn’t realise that the article by Sandrine Maugy in the next unit recommends alternatives to the cadmium paints I used for this assignment, until after I had finished my tulip paintings. I will endeavour to obtain the hues recommend in time for my next submission. 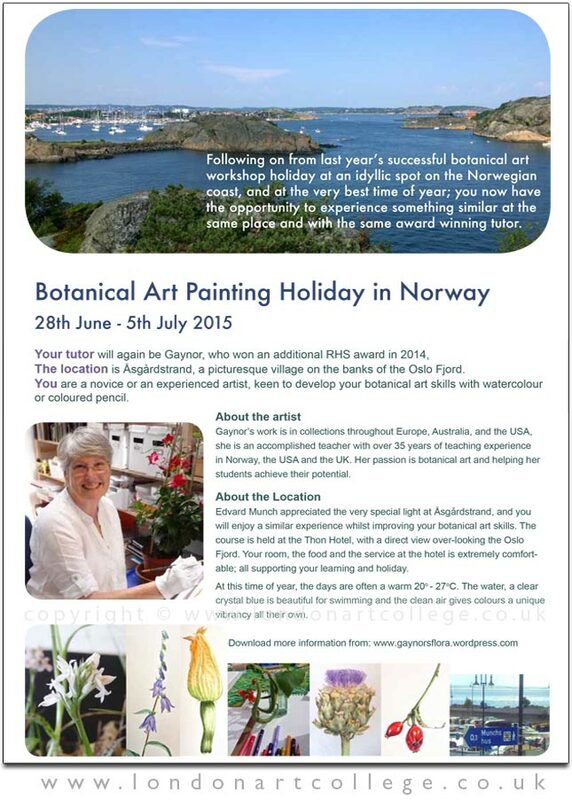 Our Botanical tutor Gaynor Dickeson is organising a Norway painting holiday. All of the details are below and don’t hesitate to contact Gaynor for details. This botanical art workshop holiday is intended for people with all levels of experience, as long as they are interested in plants. Last year, people came from around the world and their experience varied from complete new beginners to experienced artists. It works at all levels as the workshop is kept deliberately small. 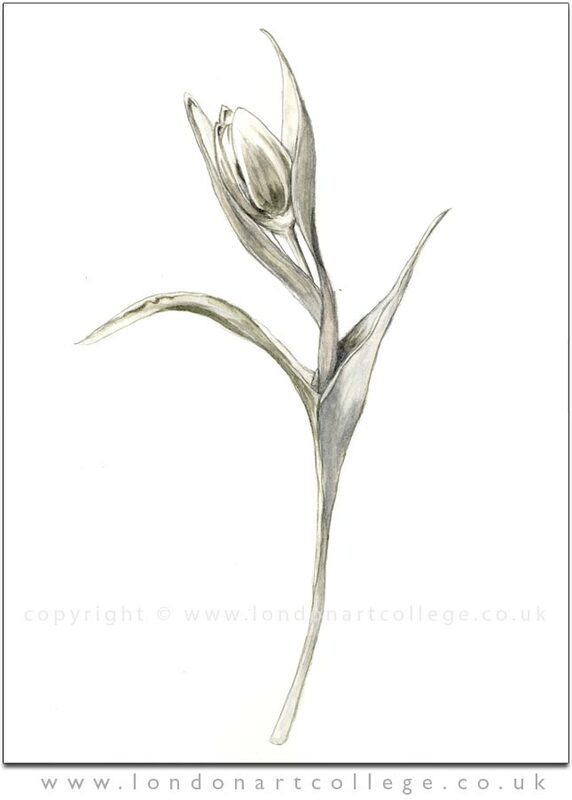 New for this year is the forming of a new botanical art society in Norway. Botanical art is a little known art form in Norway, but this workshop will give those living in Norway and travelling from other countries, an opportunity to learn something about Norwegian plants in a fantastic environment. If you have any queries, do contact me via this post, or my blog. I look forward to hearing from you. When former LAC student, Julie Ann Maguire graduated on the Coloured Pencil certificate course last year, she had a string of CP drawings appear as exhibits in Birmingham, Nottingham and Somerset. 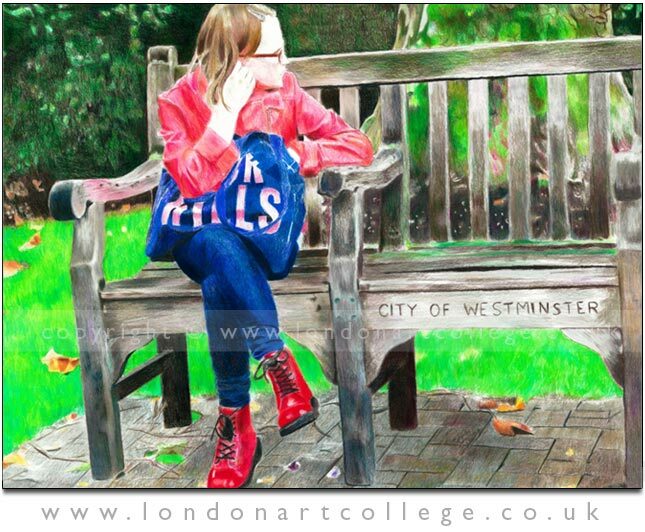 Continuing to flourish this year, she has a portrait of “Girl with a Jack Wills Bag” which has been accepted for an exhibition at the London Menier Gallery between 6-16th May 2015. Billy Showell, Michael Angove and Paul Sacki are the entry judges who have shortlisted her work for the 14th Annual UKCPS Open International Exhibition 2015. We wish her every success for the coming year. 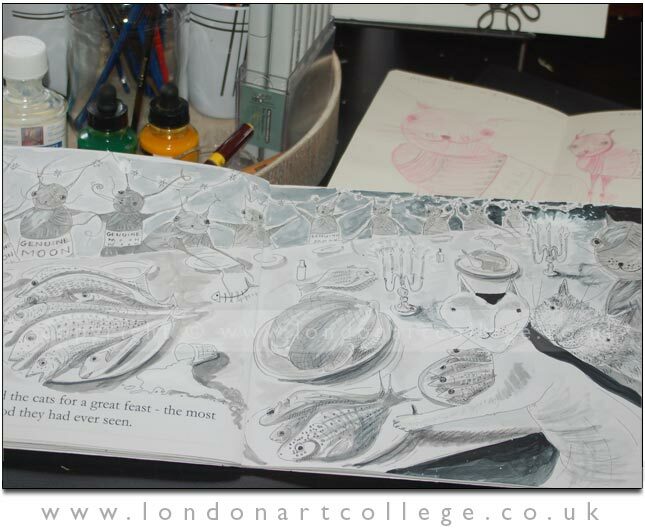 Initially I completed the Illustrating Children’s Books diploma course with Maggy Roberts and achieved a distinction which was great and it gave me the confidence to enrol on the follow on course, which I have now just completed. The aim of the follow on course was to write and compile a children’s picture book concept and to have a dummy book and 3 pieces of completed artwork that would be suitable to submit to a publisher and also begin work on compiling a portfolio of work. 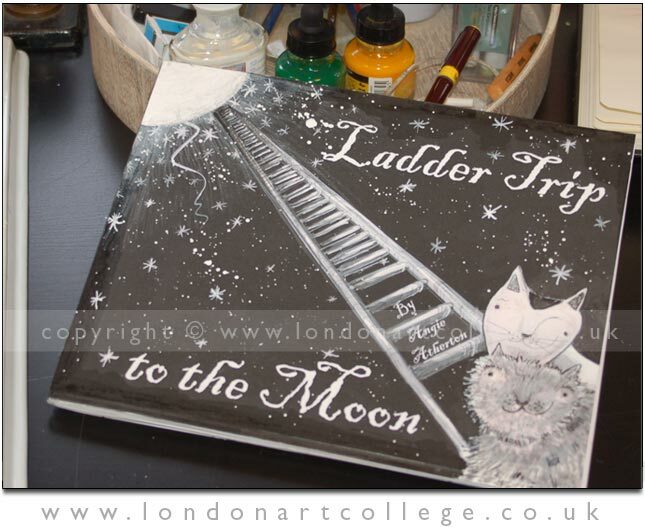 As cats are often a source of my inspiration, I chose them and their ‘Ladder trip to the moon’ as the theme for my book. Once Maggy had ironed out my ‘over-wordiness’! and the text was approved, we worked on character formation – I really enjoyed this part and soon decided on my three main characters, I then created a storyboard, to work out the final page layouts for the finished book and once approved I began work on the dummy book – a life-size ‘rough’ of how I imagined the final book to appear. 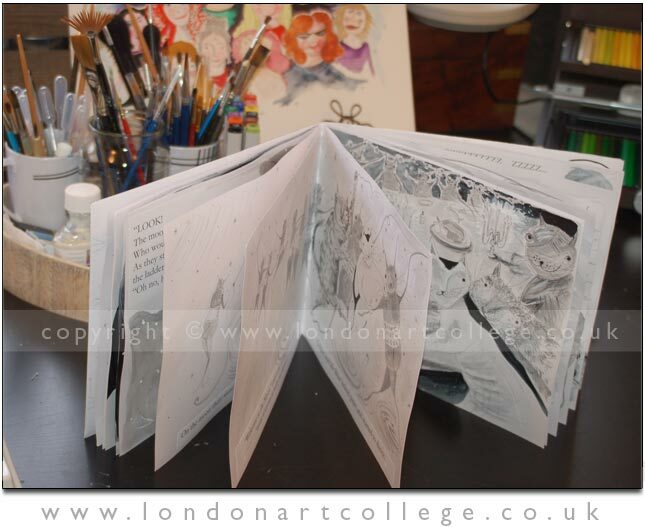 I spent some weeks on the dummy book, as I wanted to get it completely right and was pleased with what I had achieved. Maggy was pleased with the dummy book and gave me the go ahead to produce the artwork with no changes to the actual dummy book. I created my favourite scenes from the book, the scenes that had action and humour in them and set to work. After trials with every type of medium, I felt that watercolour and inks were where I was happiest and produced the artwork in that medium. Maggy approved the artwork and gave me the go ahead to find some prospective publishers to post my work to. I did extensive research, using the children’s writers and artists yearbook and also the Internet to find publishers that most suited my work, but also I felt I might have a chance to approach as many will not see submissions unless you have an agent. I found 3 publishers that I felt best suited my ideas and created 3 packages each containing a copy of the dummy book and copies of 3 of the completed artwork double page spreads, a cover letter and an envelope with return postage and return address label! All of the chosen publishers stated that it usually takes 12 weeks before they respond, this was 5 weeks ago, so I still have a wait to find out if I have been successful or not! I really enjoyed the whole process from the original spark of an idea, seeing it through to a completed dummy book ready for submission, I feel that even if it is not published, I have achieved so much in experience and the confidence to keep trying and hopefully one day I will have a published book. I have now just signed up to do the Digital Illustration course as I still want to learn new techniques and hope that this medium will enhance and build upon what I have already leaned with Maggy. I think this has to be the most illustrative house assignments we have received in a long time. We are loving the colours and attention to detail here, there is a lot to see and find within Pamela Zwickert’s house assignments piece. We could easily see it being created in a children’s book!